If you set one foot outside of an airport in Russia, you’ll find yourself in a whole world of trouble. Russia is so safe, even small children could travel there unaccompanied and have a blast! People like making conclusions about places to which they’ve never been. I’m Russian, and I know this country very well. Yes, it’s very different from European countries, but there are no unbelievably terrible or strange things awaiting you. After all, is it dangerous to walk through the streets of New York? Think of Moscow the same way. 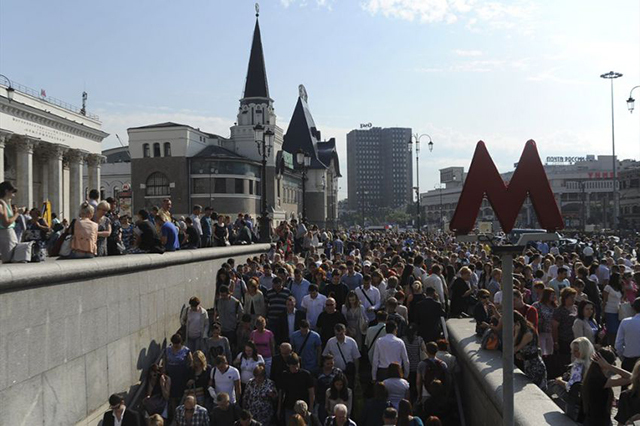 Like New York, in Moscow, there are different people and various districts. Your safety depends on many local factors. 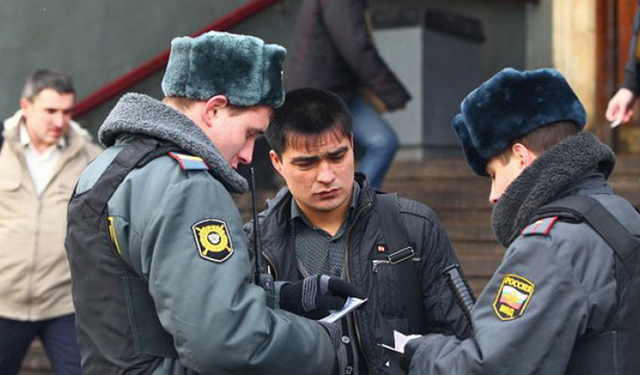 You’ll hear the same kinds of precautions about any country, and Russia is no exception. This is a common rule for all big cities around the world. While the possibility of getting lost is a major concern, the much more dangerous consequence of such exploration is running into criminals who would love to meet a foreigner or two. I don’t think this topic requires any further explanation. Once when I was riding the Moscow metro, somebody stepped on my foot really hard. I looked around for the culprit, and some guy started apologizing. He said he was very sorry, calling himself a “clumsy elephant” and an “oaf,” to which I answered, “That’s ok. No problem.” However, even after my reassurance, his apologies were endless. When I left the car, it turned out that my wallet had disappeared from the back pocket of my jeans, and I could only watch helplessly as the thieves melted into the crowd. Criminals are very clever. They often “play in pairs”: one of them distracts their victims while the other takes money or anything else valuable. Don't make the same mistake I made! Keep money and any important documents or personal belongings in inner pockets. Hold your bags tight. There is a traditional Russian joke about shawarma: “Was this food meowing or barking yesterday?” Yes, it’s rude but very clear. Nowadays, the authorities have begun to exert stricter control on eating establishments, so there is only a small chance you will be offered cats’ or dogs’ meat as a dish. However, it’s still not worth the risk. Furthermore (and perhaps even more disgustingly), this food is out all day under the hot sun. Would you call that a sanitary way to store and prepare food? I don’t think so. Update from our reader: First of all, half a year ago city's government destroyed every small shops around the metro stations. That's why now you can not buy shawarma. Secondly, as I know in pharmacy sales-managers do not speak English. And the last, I do not remember beer point in this summer (this thing was typical in summer same years ago but now I think, it's out of law). Cheap sushi restaurants also can be harmful. You can never be sure where this or that fish originally came from. 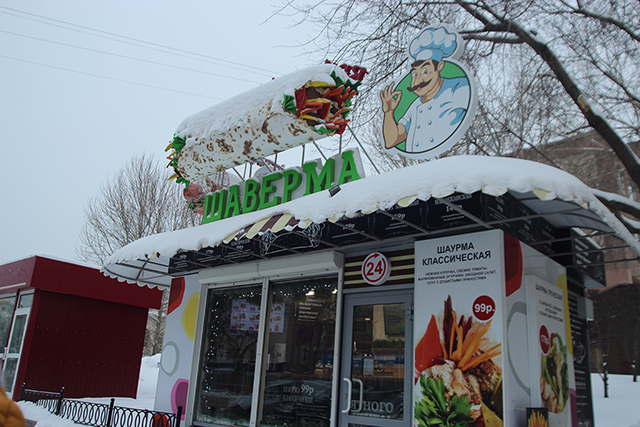 Some cheap restaurants might ignore essential food processing steps and you probably would want your first trip to Russia end up at a hospital. So, it is better to eat in a plain but decent cafe or canteen. I remember Russia in the 90s. Official yellow taxis were very rare, so it was common to use unlicensed cabs (meaning anyone with a car could pull up on the curb if you waved your arm to hail a taxi). Today there are hundreds of official taxi services, but for some inexplicable reason, many foreigners and locals alike still prefer unlicensed cabs. Why!? An unofficial “cabby” will make you pay three times as much for a ride. Moreover, these “cabbies” will intentionally choose a longer route to raise the fare for their services. Such drivers like to cash in on unsuspecting foreigners. Remember: unofficial drivers can be crooks. If you’re not from Europe, you may not know that some government offices require you to show your passport upon request. You may also not know that a policeman can stop you to check your ID, usually your passport. Are you sure you need the hassle of being asked for your passport and not having it? Just put the little book in your pocket--your inner pocket (don’t forget Don’t #2!). Thieves might not be interested in your documents, but they won’t waste their time separating your passport from your money. They take everything and leave you with plenty of troubles. It’s prohibited by law. 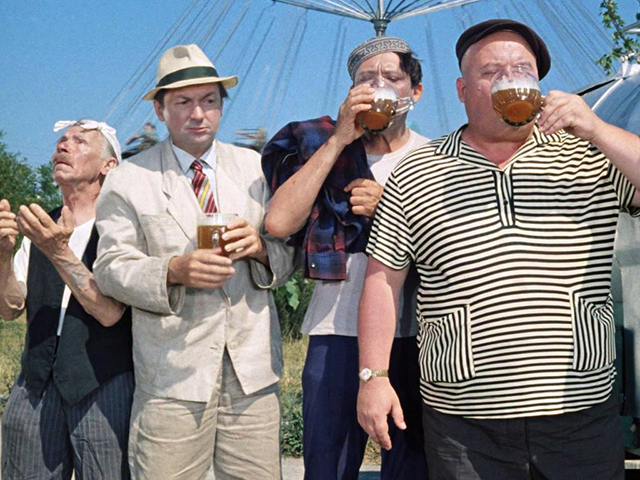 Yes, Russians drinks cold tasty beer on trains, in parks, and near malls and cinemas, but no matter how much you’re tempted to do the same, resist the urge to follow suit. They are in their own country and know the rules. You aren’t. Be very careful with alcohol. It’s best to keep a clear mind in a foreign country. I’d like to tell you about another crooks’ trick. Five years ago, my friend Aleksey was across a public square when suddenly a man called out, "You dropped your wallet!" 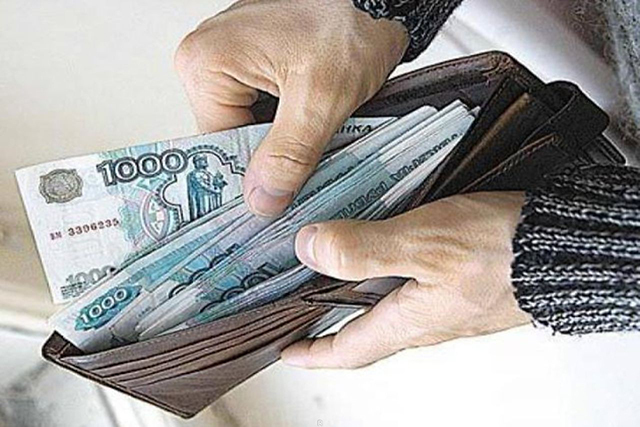 As Aleksey’s wallet was still in his pocket, the stranger then said, “Let’s share the money, since we found it together.” Aleksey didn’t want to, but he agreed anyway. He needed some money, and this was a lucky coincidence. He followed the guy around the corner so they could split up the cash. Suddenly another man accompanied by a policeman approached them. "Give my money back!" he shouted. 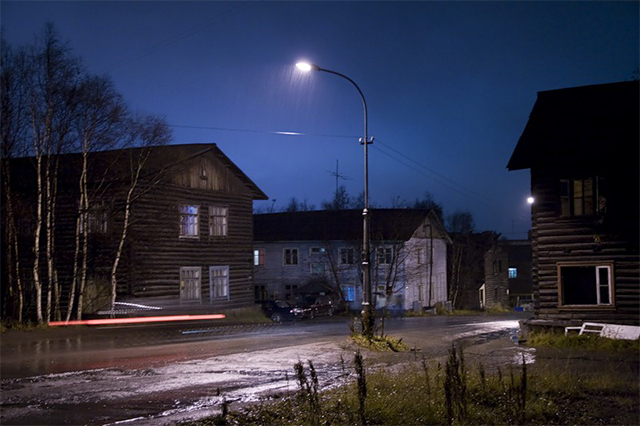 The first man silently disappeared, leaving Aleksey to give back all the money, including his own. This is just one example. There are numerous ways to trick naive people. Be careful! Don’t change money, don’t take strangers’ stuff, and don’t hand a stranger your phone if they ask you to make a call for them. Do you know what Russians do if they’re ill? They don't like to visit doctors, so they just go to a pharmacy. I once heard a man say to a pharmacist, "My temperature is 37.3°C (99.14°F), and I have red spots here and here. Please, give me some pills." The pharmacist understood him and gave him the pills without an examination, diagnosis, or prescription! 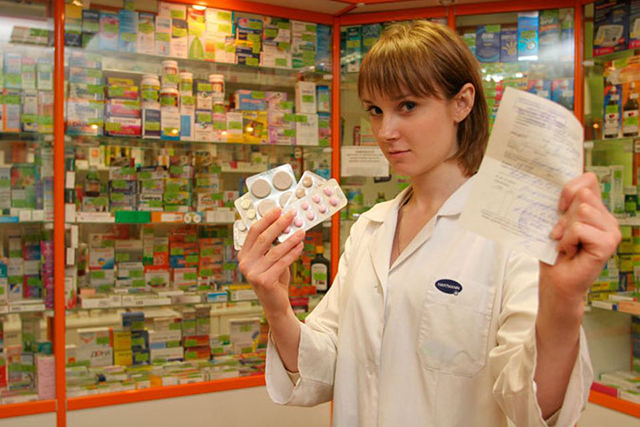 Of course, not all Russians treat their health so carelessly, but it’s very common. Maybe if you live in Russia for a long time, you’ll get into the habit of skipping doctor’s appointments, but I kindly advise you to avoid this. Let me remind you: Russians are in their native country. They have free health insurance. You must think of the consequences of self-treatment. Even though prescription medicine is expensive, avoiding the doctor might cause you to misdiagnose yourself, which can lead to greater health problems. 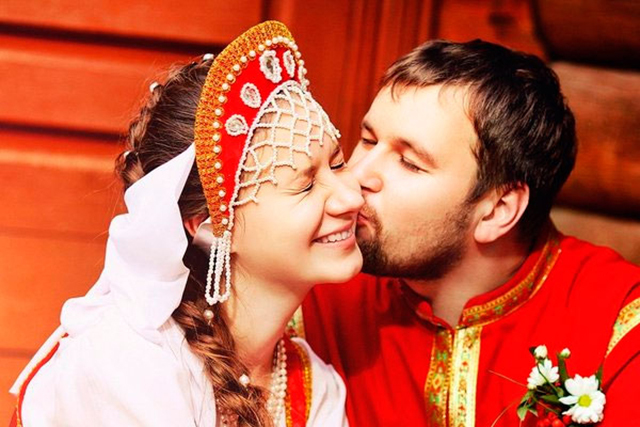 The idea that it’s appropriate and expected to kiss complete strangers as a greeting is another myth about Russians, one whose origin can be found in politics. Have you heard of Leonid Brezhnev? He was a Russian leader who used to kiss foreign visitors right on the lips. It was how he demonstrated his respect. Now, neither politicians nor ordinary people observe this tradition. They just shake hands. Kisses are for close friends and relatives only. 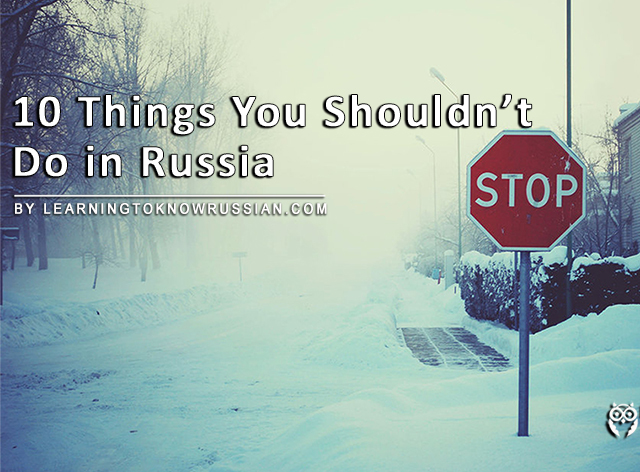 These are just a few of the tips I’d offer to prepare you for a trip to Russia. I hope my “Don’ts” weren’t too scary. If you did freak out a bit, maybe you’ve already bought kidnap insurance. Have you learned how to use a gun? Have you hired a bodyguard? No? Right you are! If you are an ordinary person traveling to Russia for pleasure or business, you don’t need any of those things. Unfortunately, I can’t help you with the third one, but the Russian Program for Fluency will solve the first two problems! With the Program, you won’t just learn the words. You will learn how to pronounce them properly and use them in conversation. You’ll be able to understand simple but very important traveling questions by ear so you can enjoy a carefree trip to Russia. 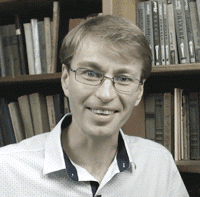 Many people think the Russian language is very complicated. 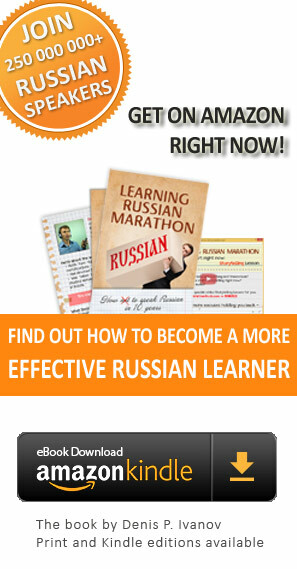 Believe me, the Program will help you conquer the great and mighty Russian language! Try to notice Russian peculiarities, and you'll feel comfortable in this country.